How far can YOU skate in a day? Come and discover your potential! 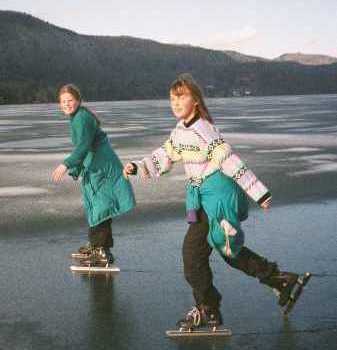 Lake Morey in Fairlee, Vermont is the home of the longest ice skating trail in the US. Registration, lunch and awards will be at the Lake Morey Resort. Donation of $20-$25 per adult and $10-$15 per junior includes free Nordic Skate rentals - while supplies last - and a 25% discount coupon good at Nordic Skater. Snacks and hot drinks available in a heated tent on the ice. For more information: (802) 649-3939 or (802) 649-9075. Proceeds benefit Upper Valley Trails Alliance and Connecticut RiverFest. Carry this card with you. When you reach the far end of the lake, come inside our heated tent and we'll stamp your card. Collect as many stamps as you can! At the end of the day, show us your card. We'll compute your total distance and issue your Official Certificate. Directions: Interstate 91 north to Exit 15 in Fairlee, Vermont. Left under highway. 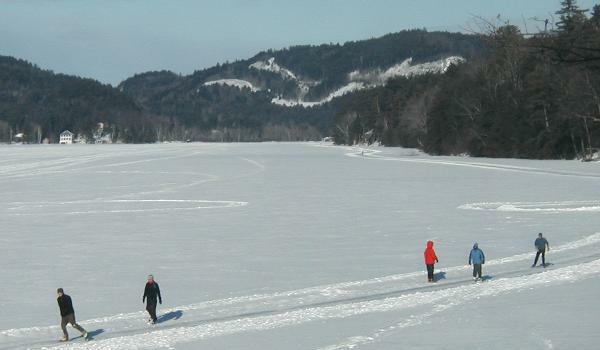 Take first right onto Lake Morey Road, follow 1/4 mile to Lake Morey Resort on your left.